Only Kramer was stirring, in hopes of a mouse! The socks were placed in the dryer with care, desiring warm feet, as we waited by it’s side. Daisy was nestled all snug on her bed, while visions of frolicking dancing in her head. Les in his boxers, and I in my Tee, had just settled in for some really good TV. When out on the lawn there arose such a clatter, we sprang up to see just what was the matter. The moon on the ground shown the drenching of rain, it’d been pouring for days with much to be gained. When what to my wondering eyes should appear, a miniature sleigh, and two mechanical deer. It all worked in sequence, with lights blinking fast, a Santa with presents, set up on the grass! One had to be Rudolph with his nose shinning bright, the other was Comet sitting just out of sight! Off to the kitchen to make us some tea, we’ll eat a few cookies, while we watching TV. “A Merry Christmas,” and a Happy, Healthy New Year! The shopping is finished, with all kinds of gifts. It’s finally our time to take a deep breath! Every year I think I’m going to cut back, then I see some new things, and I just can’t resist! This year again, all my shopping, with little exception came from the internet! I always think I’m incredibly clever to be able to pull this off – shopping without leaving the house. The only thing better than ordering from Amazon, is if Santa himself dropped them at out front door all wrapped and ready to go. I would leave a key under the mat if Santa would do that for me! Fortunately this year, I shopped wise, and quick, all in a months time. The gifts have been wrapped for over a week, and there isn’t any stress in this house! Have a wonderful, blessed Christmas. May the time spent with friends and family be magical. I wish everyone good health, warm nights, safe travel, and a happy New Year! This is Christmas Eve…the family will be here for dinner. I had minute, and I choose to use it to speak to you my dear friends and wonderful followers. As usual, in the New Year I hope to do more experimenting, and sharing. More growth creatively….are you in? This is what happens when you are standing at a reptile store when someone just happens to drop off a pet rat. My granddaughter Sage had to rescue it so it wasn’t used for food. She had to save his life, and that is my sweet Sage. All my grandkids are savers of critters. And critters they have. After convincing her dad that the rat needed saving, she went back to the reptile store to get him. Now he lives in a wonderful terrarium, with all the primo food and love he needs. This week is considerably cooler, even the humidity isn’t so bad. The air is still on, and we are still glued to the TV, and reports of the horrendous hurricanes that are happening in the Southeast. Les and I haven’t stopped worrying about everyone since before Harvey hit Houston. Other than donating money, clothes, etc, Les and I can’t participate, or help in other ways. So we watch and listen. Meanwhile, I need to stay busy, and my busy is usually my art. 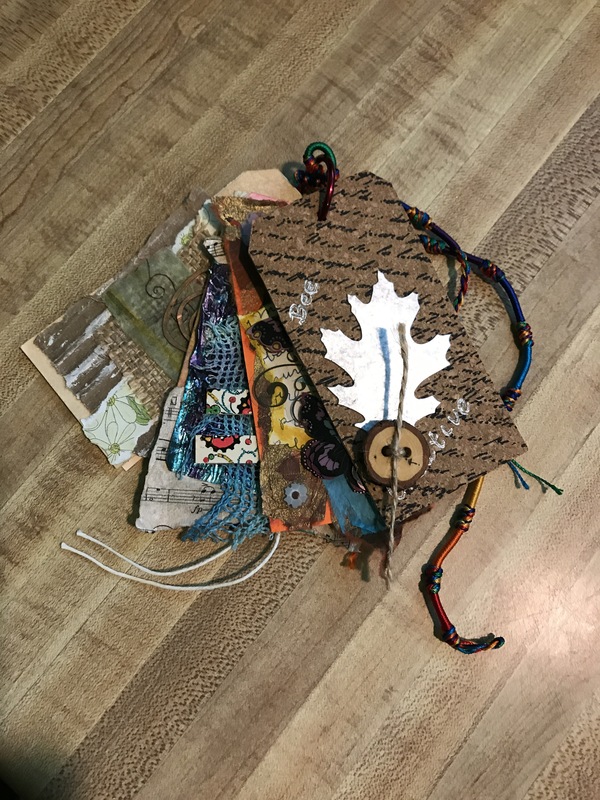 This week I’ve been working on my third Prayer Flag, and more tags. Being a Mixed Media artist gives me an excuse to save all kinds of little things. Bags of things know one else wants or needs, pieces of fabric, anything you can imagine somewhere in my stash of goodies….I have it. Putting it to work is key in this process. While the entire West coast is battling this horrible heat and even worse humidity, I’m more zapped of energy than usual. We live about ten miles off the Southern California coast, and while you’d think it would be cooler here, it isn’t. It’s actually hotter here than some places inland. I said some, other places are still miserably hotter. Here on the coast, we didn’t sign up for this. In fact we pay high prices (not willingly) to live here with the promise of ocean breezes and cooler weather. There isn’t any debating it, we’ve been ripped off! Big time. As the weather changes everywhere, our weather here in “Paradise ” is also changing. Paradise isn’t the same as when we moved here. It isn’t my style to spend time complaining, and my point isn’t to rag on Mother Nature. What I’m trying to say is this….. in the heat and humidity my energy level changes. It also changes in the winter when it gets dark early and cold. I have a small window available to be creative on a large scale. Sometimes when an artist is tapped out, they do things like veg out, or do other kinds of art escapes on a much smaller scale. Don’t get me wrong, I do my fair share of vegging out while my mind is “thinking.” That’s called replenishing the well. In this case the well of creative energy. My creative energy goes way up when I get together with my art sisters, or look at ideas on YouTube or even Pintrist. Last weekend it was both hot, and humid. My husband and I stayed inside to wait out the high temps, and sticky weather. But I can’t just look at the wall, or watch TV all day. Even journaling was difficult to do, so I decided to create in a different way, an even smaller way. As I started to work, I slowly began to get lost in inspiration. Little by little small ideas came to mind, and I remembered a box of trinkets just waiting for something to call home. 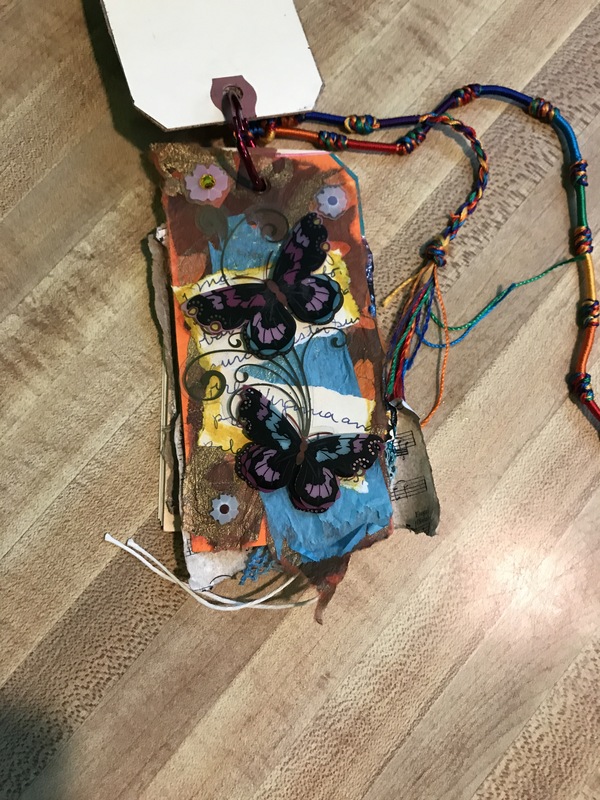 One thing led to another, and before I knew it I was starting another tag for my Tag Journal. Since I published this by accident, after working for a couple hours cleaning my studio, I’m going to finish it up next week. Thank you for visiting Stone Soup, see you soon….. While battling heat over the weekend, it left me no choice but to resort to surfing You Tube. This is what I have for Tuesday…..It never hurts to polish up on our drawing skills! I can’t tell you how excited I am to see this film, & hope you will want to see it also. How many of us can we get to see this film when it finally comes to North San Diego?